Wow, looking back I really lost my way this fall. It was an odd fall that stayed warm through November. My straw bales, located in front of my lannon stone home and protected by the strong wind thrived late into the season. I had a major problem with a wasp invasion in July and August that kept me away from dealing with the cherry tomato and squash vines. By the time I was able to wade through the vines safely, they were everywhere and I mean everywhere. The tomatoes were prolific and fantastic in taste. Sweet and juicy, ripening late season which made them even more enjoyable. The summer squash, Zephyr being my favorite (put a link?) grew endlessly. I picked them small to keep them sweet and ate them raw or sautéed. A simple salad of Zephyr squash, cucumbers and fresh herbs…yum! I planted early season Kale and Swiss Chard that grew until mid-November when we finally had a bit of snow and frost. The kale would have lasted through December if my daughter and her friend didn’t run all over the tops of the bales during the first big snow of the season! Cherry tomatoes grew and really got going late in the season. I think that as the straw decomposed and held the heat in August and September, the tomatoes thrived. Pepper plants did not do well, nor did my watermelon. Squash grew like crazy and I had early summer squash still growing in the fall. What did I learn from my straw bales this year? That they are fantastic and a terrific way to grow veggies. I already knew this but it never hurts to learn it again! I had fewer pests and diseases than the main garden and the plants grew later into the season. What would I recommend? Try straw bale gardening IF you have ready access to water, they are best with drip irrigation daily. My husband set up my hose with a timer, all I had to do was set the timer for15 – 30 minutes and the watering was done. Amazing. And next season? Expand of course! More flowers for color and pollination. Dwarf type of tomatoes to contain the long vines. The tomato jungle really was too much to handle and I hate wasting tomatoes to chipmunks and mice that can eat them on the ground. I’m going to add spaces between the rows of bales for walking and management as well as to control wasps and hornets. Carrots grow like crazy in year old straw bales and I’m going to try fingerling potatoes in the old bales. And maybe peanuts this year. Why not? It has been a cool and wet late spring and summer but my straw bales are healthy and growing. The wind break from the house and the southern sun exposure make for a perfect growing environment. I put up a basic trellis with twine so that the vegetables have a place to grow upwards. Vertical growing either in a straw bale garden or in an flat earth or raised bed garden makes for heathier plants overall. Today’s photos are cucumbers, tomatoes, winter squash (to be honest I forgot what I planted in this bale but it sure is happy growing there!) and zephyr squash. Zephyr squash are my absolute favorite. It is a summer squash crossed with a yellow acorn. Its delicate, tender and sweet as well as easy to eat raw in salads. I love growing things in straw bales! A few years back I read the book Straw Bale Gardening by Joel Karsten. The idea is basic. When you add nitrogen to a straw (not hay) bale it starts to decompose. As it decomposes it releases nutrients that feed other plants. 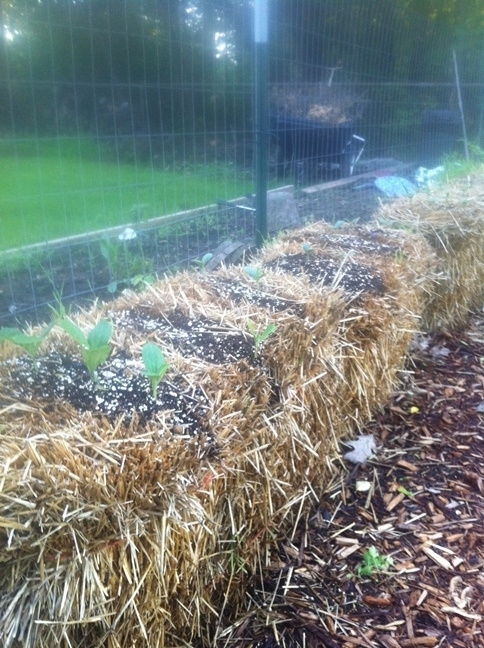 Straw bale gardening provides a nutrient grow space that can be placed anywhere. No digging, no kneeling, and fewer pests. Sounds amazing right? Well, I have to give it to Joel, it really is. I have been planting a straw bale garden for three years now and have had a lot of success with it. I have had some difficulties as well, but what gardener doesn’t? This year I am going to experiment in my front yard with a straw bale garden. I have a lannon stone home that gets full sun and has a water source. There is little landscaping that gets in the way. My plan is to GO BIG and show the neighborhood and my blog followers how the straw bale garden is started and how it develops throughout the summer. You can try it too! All you really need are straw bales, nitrogen to begin the decomposition process, drip irrigation or easy access to frequent watering, some good quality potting soil and either seeds or transplants. Stay tuned! When deciding to start a straw bale garden you first need to locate where you want to place the straw bales. You need a spot that receives full daytime sun. When you decide where they should go, you have to stick to your decision. Once the straw bale has been watered and conditioned it is super heavy and will be very difficult to move. You then need to purchase straw bales. They should cost 3-5 dollars each. First of all make sure that it is straw not hay. Hay will contain grass and weed seeds and be a mess. Straw will not. Yes, there will be some grass that pops up along with mushrooms but it is easily removed. You can find straw bales from local farmers, garden stores and big box stores like Home Depot. Next you need to position the straw bale so that the straw is lined up and down and the twine holding it together is parallel to the ground. Preferably there should be 2-3 pieces of twine holding it together as it starts to decompose and fill with water it may fall apart. You can plant either seeds or transplants. After the preparation of the bale you can take good potting mix or organic compost and put it down 2 -4 inches thick on top of the bale. DO NOT use soil out of your garden. Why introduce weeds?? Plant your seeds in the soil and keep the bale wet but not drenched. Or you can remove portions of the straw bale in clumps, 2-3 inches deep, put in potting soil around the transplant and place the transplant in the bale. Or you can do both seeds and transplants! Whatever makes you happy. Last year I transplanted some pathetic looking tiny kale starts that I had neglected and the kale grew vigorous and was yummy. Ask my neighbor Deb. This is very, very important. I prefer a dripper hose, some use a gallon milk jug with holes punched into the cap turned upside down a few inches away from the plant. Whatever method you choose, they require a lot of water.